Setup of a labeling system that makes it easier to choose parameters when applying a shared action. Sequence of statements and decisions in a conditional action is very important because Captivate will always evaluate each statement and decision in sequence. Choice of optional parameters for a shared action. Using On Enter Slide events to reset variables and objects. Using groups to simplify advanced/shared actions. Gr_Match: group with the images of the matchsticks. For labeling I divided them in 3 groups. I_MS_11 is the most left matchstick of the first group, I_MS_22 is the upper matchstick of the second group, I_MS_35 is the bottom one in the third group, etc. Those numbers will also be in the names of the Outlines, the Click boxes and the associated variables. This group is initially visible. Gr_Txt: which is expanded on the screenshot has the three messages that are used in the game. This group is initially invisible. EnterIntro: conditional advanced action with two decisions that is triggered by the On Enter Slide event for the first slide 'Intro'. 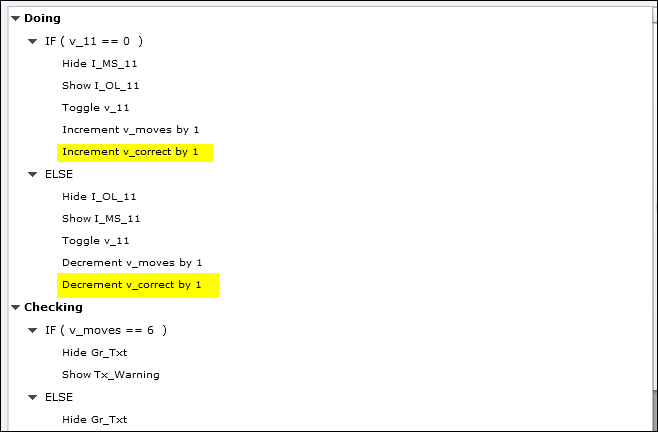 It will check the value of the variable v_visit and jump to the second 'Game' slide if it is not a first visit. ResetGame: a standard advanced action is triggered by the Restart button Success event, and by the On Enter Slide event for the second slide 'Game'. It will reset all the variables and restore the initial view of this slide (no outlines, only images). 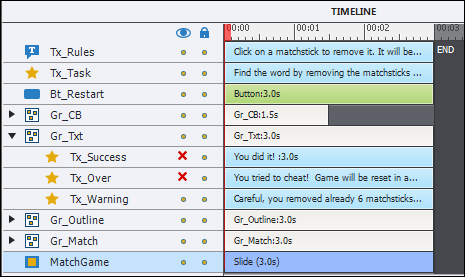 Simple action 'Go to Previous Slide' is triggered by the On Exit event of the second slide 'Game'. 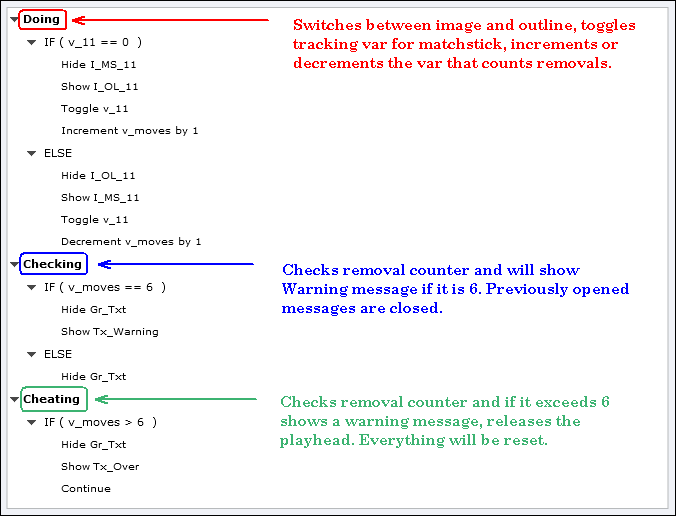 MatchStickNOK: to be triggered by a click box over a matchstick that should NOT be removed. This shared action is used 9 times. It is a conditional action with 3 decisions: 'Doing', 'Checking' and 'Cheating'. 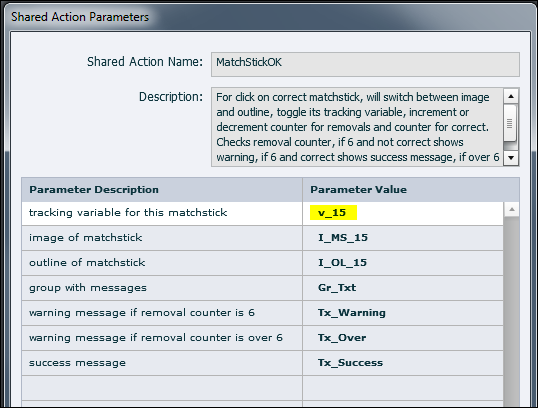 In the screenshot you'll see this action, with as an example parameters are set to the '11' matchstick. That is a matchstick that should in this case trigger the second shared action. This shared action has 6 parameters. 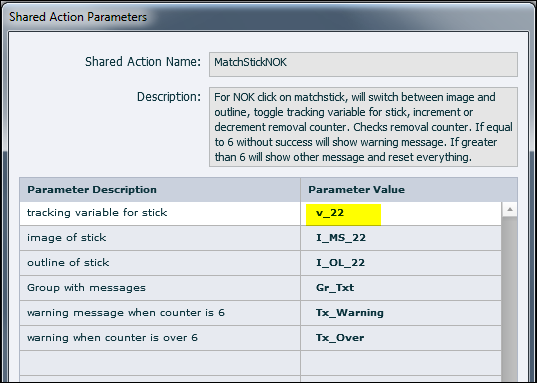 The only optional parameter is highlighted in this screenshot, it is the tracking variable v_x associated with the matchstick. No need to define the other variables (v_moves, v_correct) nor the literals as a parameter. This shared actions has 7 parameters since the Success Message has to be added. Only optional parameter that was upgraded to a real parameter is again v_x, the tracking variable associated with the matchstick. I hear you! How will it be possible to use those shared actions for a Matchstick Game with another setup? I have some ideas, what about you? Please post your suggestions in a comment. The course was totally linear, which is a requirement for the simple work flow I will propose here. To force the student the first time to have the slide played totally before being able to continue is simple: use a custom Next button, timed at the end of each slide, do not use a playbar but a TOC for navigation to previous slides. And set up the TOC settings to allow navigation only to already visited slides. To improve the user experience, when he is coming back to an already visited slide, the Next button should appear from the start of the slide. That way he can skip part of the slide if wanted. The easiest way to solve that problem is by using an extra, replacement Next button. Because timing from start till end of a slide is the same for all slides, this can be a shape button put on the first slide that is timed for the rest of the project, always on top. It is not possible to use a shape button on the main master slide because such a button has no ID, which means it cannot be controlled, shown/hidden which is necessary for our use case. The initial buttons can also be shape buttons and for a seamless user experience I'd recommend to use the same look for both the initial and the replacement Next button. However those initial buttons need to be individual buttons on each slides because not all slides will have the same duration, especially when they have VO attached as slide audio. Watch this movie to check the solution. To make the switch between the initial Next buttons and the replacement Next button clear I used a different style. Moreover I inserted a text container with two variables: the system variable cpInfoCurrentFrame and a user variable v_frames (see later) that are used to solve the problem. To navigate back to already visited slides, open the TOC with the red curved arrow top left. The TOC close button has a similar look. Refresh the browser to start the movie again. I didn't check AutoPlay, you'll have to click on the (ugly) arrow in the middle of the slide. I created one user variable: v_frames. The system variable cpInfoCurrentFrame will be used as well. This variable will be used to store the current frame number when the user clicks on an initial Next button. Example: on the first slide the initialNext button Bt_One will appear at 5 secs and pause at 5.5 secs. When you click that button, you'll see that on the second slide the variable has the value '166' which is about the frame number of 5.5 secs at a speed of 30FPS. It is never totally exact (should be 5.5*30 which is 165, but index starts at 0, the exact number should be 164). But for the purpose it will be used, this is OK. Success event for the replacement Next Shape button SB_Next executes a simple action: "Go to Next Slide"
On Enter event of slide 5 (last slide) will trigger a simple action: "Hide SB_Next"
The frame number of the pausing point (which is where the action is executed by design) will be stored in the user variable v_frames. Then the Go to Next Slide command is done. Why did I prefer to use an advanced action over my favorite shared action? I don't need to change this action when applying to another button. You could create a shared action if you expect this action to be used in other projects because it is easier to transfer them using the library. In that case the shared action will not need any parameters. When you transfer it to another project, the user variable v_frames will be created automatically. That is certainly an advantage! When a user enters a slide for the first time, the frame number of the first slide frame will be greater than the frame number stored in the user variable v_frames. That user variable has in that case the frame number of the Next button pausing point that was on the previous slide. But if the user comes back to this slide, v_frames will store a frame number of a similar Next button pausing point on a later slide. In that case the condition in this shared action will be correct, v_frames will be greater than the cpInfoCurrentFrame. The appropriate button is shown or hidden. It is necessary, for an unknown reason (was not the case in CP6, when I blogged about toggle buttons), you also have to enable/disable as well. This is probably due to the buttons being in exactly the same location, but it was not necessary in a previous version. It is not necessary to define the user variable v_frames as a parameter because it is always reused. It is a pity that objects have always to be a parameter, because in this particular case it would have saved some time to be able to deselect SB_Next (the replacement Next button, timed for the rest of the project) as a parameter. Maybe in a future version? Some will prefer advanced actions and duplicates to be edited for each button but remember: multiple instances of a shared action do not increase the file size, whereas multiple duplicates of an advanced action do increase file size. And I like the presence of the shared actions in the Library, and easy way to use them in other projects. I love to solve this kind of problems, trying to find an easy solution that can be reused over and over again. If you ever are stuck with such a problem, please contact me. I am available as a freelance consultant, and having taught for many years in college, be sure to get some training on top.